Loved the styling, had excellent experiences with previous Maximas, have a great relationship with my saleslady (have bought four Maximas through her), found every feature I needed was on this car, and the discount offered was much better than I was able to get at Lexus, Infiniti and Acura. 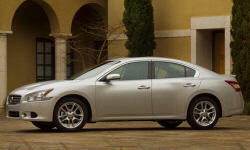 Why the 2009 Nissan Maxima? This '09 Maxima was built in Sept 2008, and I bought it new. This car has the smoothest brakes I have found in over 65 years of driving. Still has original pads, original tires approaching 40K miles. Rotated tires twice, no balancing or realignment ever necessary. Tires wearing evenly, ride is smooth well over 80 MPH. I had internal antenna (intelligent key system) replaced at 30K miles, but no other repairs necessary. I did step up to a more powerful battery at 35K miles, but the OEM battery never gave me any trouble. This has been the most reliable car I have ever owned. This car has the Premium Package plus the Nav Package, so is loaded with features I want. Due to poor circulation in my hands, I must have a heated steering wheel the cooler half of the year. This car has that. It also has a rear window sunscreen I keep in use the hotter half of the year. The backup camera is very clear, and I use it every day. I love the separate air conditioning system for the driver's seat. I love the engine compression braking feature Nissan added to the Maxima. Far too many features to name. At the time this car was first released, I heard conflicting opinions on the styling. Many folks were not totally pleased. But with the passage of time, the responses to the styling of my car have grown very favorable. Five years after its original release, I am still having folks stop me in parking lots and ask what kind of car this is. Invariably, they love the styling. Of course I loved this styling from the start, and knew the first time I saw it that I had to own one. I would term it as smooth and stylishly aggressive. Great color choices. This is not a class of vehicle where fire engine red or school bus orange or passionate purple would be appropriate. Other than the standard black and white, the colors are softly muted, expressive of a premium motif. I drove Datsuns (a Nissan product) in the 1970s, and switched to Nissan Maximas in fall of 2004. I have owned Maximas of all generations except the first (I did carpool in a 1st gen Maxima for three years). I have always been impressed with the features, styling and performance of Maximas. As long as Nissan continues to give me the best combination of price, performance and features, I see no reason to switch. Why Not the 2009 Nissan Maxima? The rear seat of the 7th gen Maxima is slightly smaller than that of the 6th gen Maxima. Still fairly roomy, but slightly smaller. This is understandable because of the major styling change, and the conversion from 'near luxury family sedan' back to 'near luxury family sedan with a sporty edge' that took place between these generations. I personally feel a car in this class needs power folding outside mirrors. The garages in our current custom home have ten foot wide doors. But many newer homes, especially retirement homes, have garage doors as narrow as eight feet. This leaves only inches between the mirrors and the garage door opening. With eight foot garage doors, these mon-power folding mirrors would be very inconvenient, requiring careful attention and very slow movement entering and leaving. Either that or opening the windows in a downpour to manually fold them. I feel it may be time for Nissan to consider a longer standard warranty for its flagship vehicle. Four years or 50K miles would be a nice move. Taking this further, I have long felt a vehicle warranty should never have been an 'either/or' thing, but a combination of months and thousands of miles. Say a total of months and thousands of miles totaling 75. That would be fair to both drivers who drive only 5K or so miles per year (and currently lose their warranty having driven only 15K miles), as well as those who drive 50K or so miles per year (and currently lose their warranty in eight months).